Join me (and Peanut!) for our latest installment of our “1-Mile Walk n’ Talk” series! 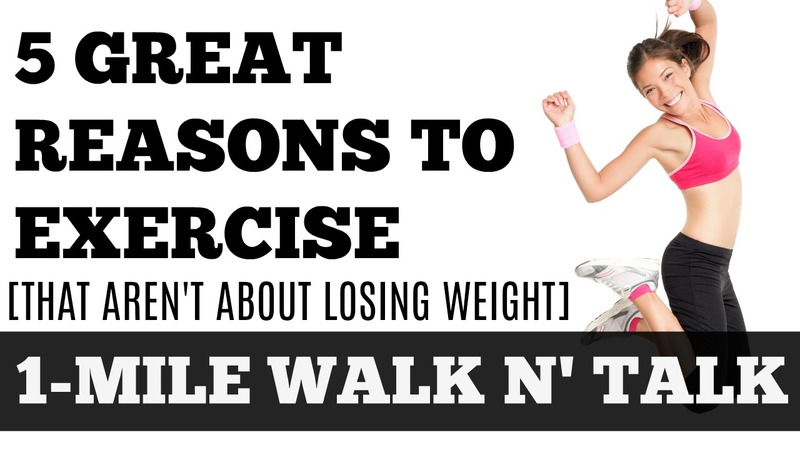 Today we’re talking about five pretty fantastic reasons to exercise (that have nothing to do with weight loss). If you need a boost of motivation or a dose of inspiration, join us for this basic, indoor walking session anytime – rain or shine! (For those interested, we purchased our round yoga mat on Amazon here). This was a great walk n’ talk. Walking for me is such a wonderful way to relieve stress. As I walk, I am able to think through issues and how to deal with them and I always feel better afterwards AND I get my workout in too! It’s a two-for-one! So great to find something that I can do while losing the 50-70 lbs that I have to shed. Thanks. I absolutely love the Walk and Talk series. I am 62 years old and in reasonably good shape. The only thing that bothers me about the Walk and Talks is when you saw they’re not a substitute for a workout. Well, for me a 14 minute mile is not a stroll around the neighborhood, talking to a friend. A 14 minute mile is pushing me and is a workout! While walking around the neighborhood I never do any side to side movements, etc. So sometimes when I hear you say that this is just to get more steps in, not a substitute for a “real” workout it bugs me!! Otherwise, I love to hear your comments about the various subjects, the hints and suggestions you give. Thanks! Jessica I LOVE you workouts! I also love your workout clothes- where do you get them? Hello Jessica, I am just discoveriing your videos. This topic is just what I needed. I tend to lose my motivation or get discouraged if I fall off my routine. I like the thought of looking at progress not pounds. Thanks for being so inspirational. Enjoyed both the walk and talk of the 1 mile workout, I am just getting back into walking due to foot issues. I saw this ” walk and talk” video today for the first time. I am now completely in love with you. I have spent years over exercising and hurting myself, taking months to recover, and starting from ground zero all over again. I need to stop this viscous cycle. Your video really helped me to get this. I really enjoy how you put a program together and I love your personality. Thank you so much for all you do!